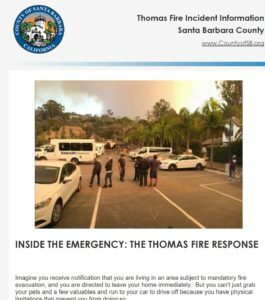 The Thomas Fire in December 2017 is the largest in recorded California history, and I want to share a few personal observations that may be helpful to those dealing with similar situations. 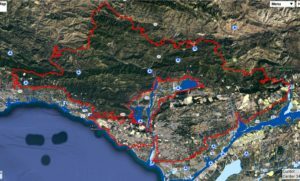 It began in Ventura County in early December and ultimately reached well into Santa Barbara County during its 44-mile long run. At the peak, more than 8,000 firefighters fought the blaze that saw 16,000 residents under mandatory evacuation order and 12,000 in the evacuation warning area. SAE Communications is called in to assist various public agencies manage their Joint Information Center during an incident; Santa Barbara County is one such entity. I worked as the JIC manager in the first days of Thomas to assist in getting many of the systems and staffing up and running. Our work is typically concluded after a few days, which was the case in this incident. This was fortuitous as I then became an evacuee (as did many public employees throughout the region, each of whom continued their service to the public throughout the incident – all unsung heroes!). Following are a few thoughts from the “other side” of an evacuation. One question remains front and center: where do those we serve obtain the information we all crave when our homes really are in the path of a major, remarkably destructive wildfire. The fire was stopped just under two miles from my home (the third mandatory evacuation I have experienced in a decade). Sadly, roughly 1,000 structures were lost in this fire, including approximately 700 homes in Ventura alone. The air quality in the South Coast of Santa Barbara County had measured as “hazardous” for just over a full week – more than 200,000 N95 respirator masks were distributed by public, private and non-profit entities. This was before the fire had even reached our county. 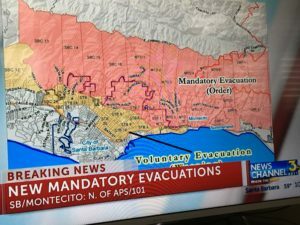 My husband and I self-evacuated, and as the incident progressed we were included in the voluntary evacuation area and then the mandatory evacuation area. We ended up staying with another evacuated couple a few hours away from Santa Barbara. We lived in limbo for 11 days, wondering what was happening but living far from the incident. We spent time with other evacuees near us, gave updates to friends/family via Facebook, called scores of friends who were also evacuated and scoured the Internet for news about what was happening back home. No Single Place for Information – There was no “one-stop-shop” to obtain all the information needed to understand what the fire was doing and its impact on our community. MAPS!!! — Maps are the most significant tool available to show where the fire is and where it appears to be heading. We craved this information and were frustrated with one-a-day updates that rarely showed street-level information. Updated Information – The numerous official public agency websites become stale quickly, and crashed at key times – but they still played a vital role as the repository for all incident-related information. Different Channels for Different Folks – Different channels reach different audiences. I would never call the 2-1-1 call center, for example, but tens and tens of thousands of people did in order to talk to a live person, ask questions and receive official information. The more tools the better. E-Newsletters Work – Public agency e-blasts are an effective way to send both hard and soft news (e.g., a feature story about how a county staff team mobilized to evacuate the disabled). Santa Barbara County prepared a feature story about evacuating disabled residents. Click on the image to see the full e-newsletter story. Daily Community Briefings Were Vital – Beginning the day the fire encroached into Santa Barbara County, a community briefing was held at 4 p.m. at a local high school. These went on for nearly two weeks. They met the community’s need to come together during a time of crisis (especially for the thousands and thousands evacuated – what else are you going to do but attend these?) and enabled one-on-one communication, which is the purest form. The sessions were available on the local ABC affiliate’s broadcast, Facebook Live, Twitter’s Periscope, the County and City’s government access channels, etc. Thousands of evacuees watched these religiously each day. Traditional Media – The news media provides the important personal narrative evacuees look for as reporters are out on the front lines, interviewing anyone they can find to share what they are seeing. Social Media – Social media, mostly Twitter but aided greatly by Facebook, was the primary place to go for the most complete picture I could create about what was happening. 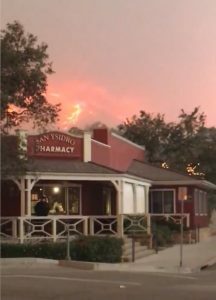 Local Broadcast – Local TV filled a major void during the most significant eight-hour period when nearly 1,300 homes in Carpinteria, Summerland, Montecito and Santa Barbara were truly threatened. We live-streamed their non-stop coverage onto our living room tv and watched intently as we truly thought we would lose our neighborhood. Nixle/Everbridge/Aware and Prepare/VC Ready – Text-based alerts from the County OEM are critical and everyone should sign up to receive these. Bored with Facts/Numbers – Public agencies would do well to tell the soft stories about the incredible work that goes on behind the scenes during a significant incident – or at least accommodate media requests for ride-alongs, EOC tours, etc. The number of acres and fire personnel are good to know but there’s no context for the information. Each incident helps us all do better the next time, and Thomas is no exception. We were on a first name basis with this brute, and I must admit that we were all quite anxious to see this big guy disappear forever. But he taught us a lot about what needs to be done when the next one does strike.